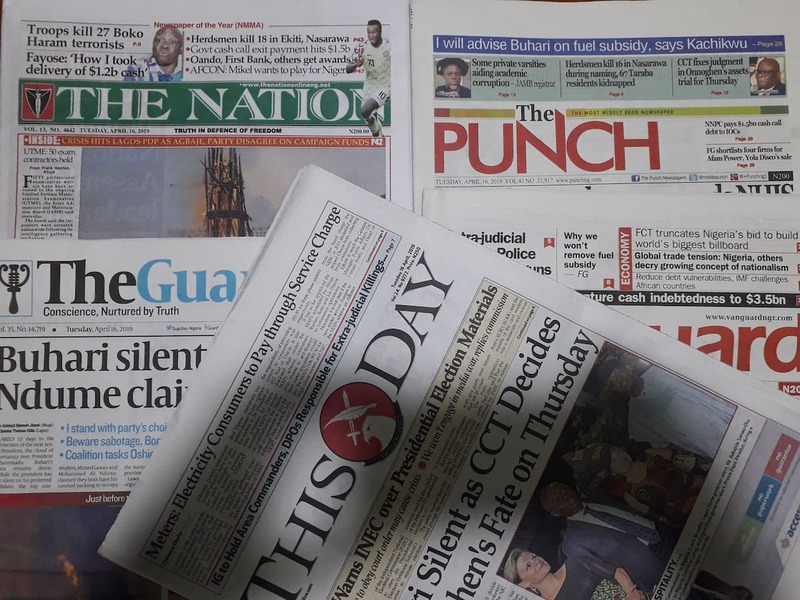 The main headlines of mainstream Nigerian newspapers of Tuesday, April 16, are focused on the race for Senate presidency of the incoming ninth National Assembly and the trial of the suspended chief justice of Nigeria, Walter Onnoghen. The Guardian reports that President Muhammadu Buhari has kept silent on his preferred candidate for the position of the Senate president of the incoming ninth National Assembly. Despite President Buhari's silence, top contenders for the position, Ahmed Lawan and Mohammed Ali Ndume, have claimed they have the backing of the president to occupy the number 1 seat at the Senate. According to Lawan, the position of the All Progressives Congress (APC) is automatically that of the president. Ndume’s supporters, however, disagreed, saying Buhari gave his blessing to their candidate before and after the February 23 presidential and National Assembly elections. The Nation reports that judgement in the trial of the suspended chief justice of Nigeria, Walter Onnoghen, has been scheduled for Thursday, April 18, by the Code of Conduct Tribunal (CCT). Onnoghen, who is being tried on six-count charge, denied confessing to hiding his bank accounts. The date of the trial was announced by CCT chairman, Danladi Umar, after final written addresses were adopted by lawyers to the prosecution and defence. The court will also deliver two rulings earlier reserved on two applications filed by the defendant, one of which is challenging the tribunal’s jurisdiction; the other is querying Umar's competence as the tribunal chairman to preside over the case. Vanguard on its part reports that there was division among Governor Kashim Shettima of Borno state and elders of the state over Senate presidency in the incoming ninth National Assembly. Governor Shettima endorsed Ahmad Lawan for the position, while Borno elders and stakeholders threw their weight behind Ali Ndume, who is also from the state. Speaking with journalists, Shettima said: “I hail from the same state with the distinguished Senator Ndume. And I appreciate the fact that politics is local. But politics is also national. And I believe the blood that binds us together supersedes whatever we might harbour. I am the first citizen of the state, I have made wide consultations with our leaders from Borno before resolving to back Senator Lawan." This Day reports that President Muhammadu Buhari has not responded to the reported notice of retirement sent to him by the suspended chief justice of Nigeria, Walter Onnoghen. Onnoghen's fate over alleged false asset declaration trial at the Code of Conduct Tribunal (CCT) would be decided on Thursday, April 18, by the three-man panel headed by Danladi Umar. The suspended chief justice reportedly sent his notice of retirement to President Buhari following indictment by the National Judicial Council (NJC) over a petition filed against him by the Economic and Financial Crimes Commission (EFCC). Onnoghen was said to have sent his notice of retirement to the president, apparently to beat NJC’s recommendation that he be compulsorily retired from service. The Punch reports that the immediate sack of the executive secretary of the National Health Insurance Scheme, Professor Usman Yusuf, has been recommended by the panel set up by the federal government to investigate the crisis in the agency. In the report, Professor Yusuf was accused of breaching the Public Procurement Act as well as the Public Service Rules. The report read in part: “Relieve the executive secretary of his appointment. Justification: Inability to work in harmony with all the relevant stakeholders in the scheme for the attainment of the scheme’s mandate. “Established cases of infractions of the Public Service Rules i.e. insubordination and refusal to carry out lawful instructions from superior authorities (governing council and the Federal Ministry of Health) contrary to PSR Rule 030301 (0), unauthorised public utterances contrary to Rule 030421 (id), and relevant service-wide circulars. “Established cases of infraction of the following provisions of the Public Procurement Act: Sections 16(6) and 32(7)."